Trend trading is a key to success and most of successful traders work with trends. Trend trader needs an indicator which has fast response to direction change and also disregards rapid and useless price changes. Here it is! 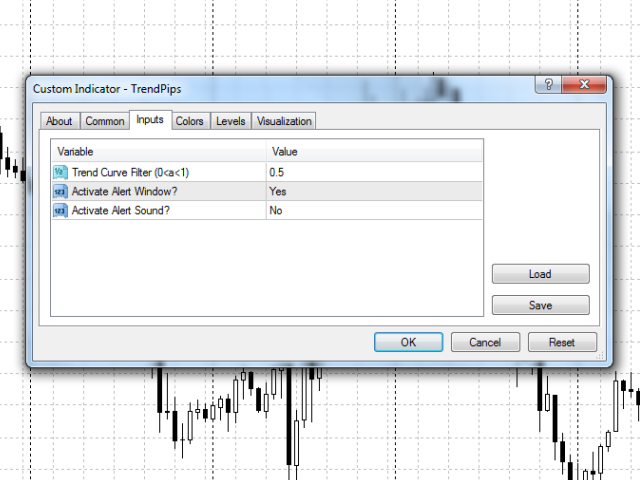 Trend Pips Indicator creates a smoothed filled curve of price variations. Rapid changes of price bars or sudden trend direction changes are the most annoying thing in trend trading. We need an indicator that removes these little waves and presents a soft trend curve. Trend Pips uses high pass and low pass filters to make round and smooth curve and remove small sharp and fast changes, which appear as ripples. 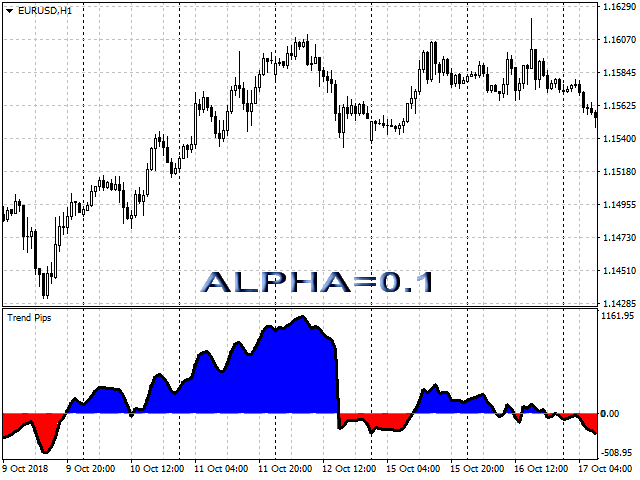 The indicator has two different colors for uptrend and downtrend. 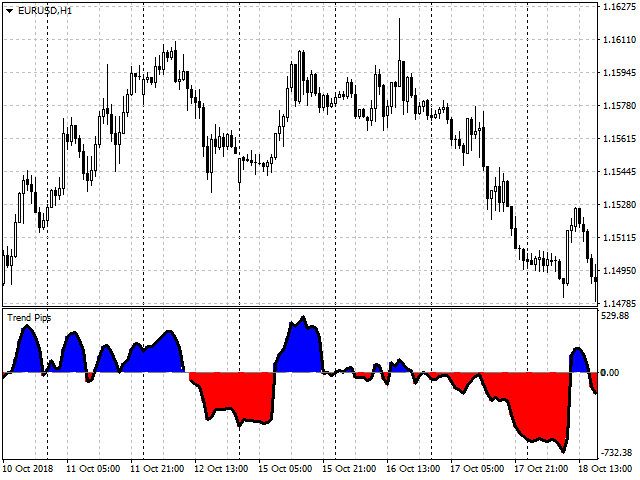 Positive values indicate uptrends and show by blue color and negative values belong to downtrend by red color. Each trend has almost a wedge shape. Value of indicator in each point, is price difference between that point and the starting point of trend. 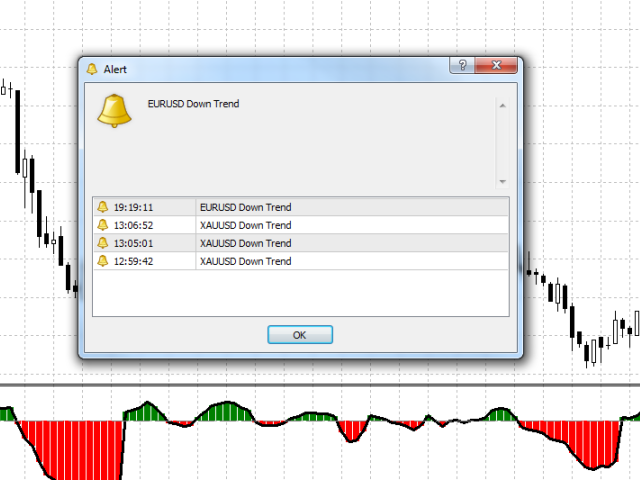 Alerts have been added to indicator to inform you about each new trend. By starting a trend, an alert window appears and you can also hear the alert sound. Both of these two alerts are optional. 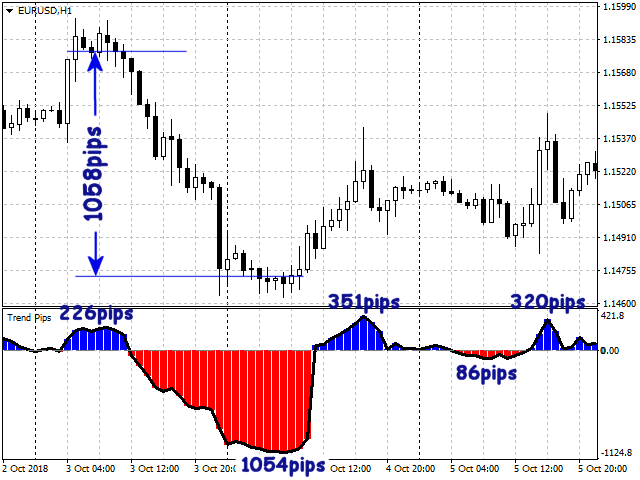 They can be used as new trend indicator to open a new position or as the end point of previous trend to close it. There is just one setting parameter. ALPHA is the coefficient of a low pass filter in the last stage of program that creates the final curve. Lower values make less sensitivity to price changes and can be used for seeking longer trends. 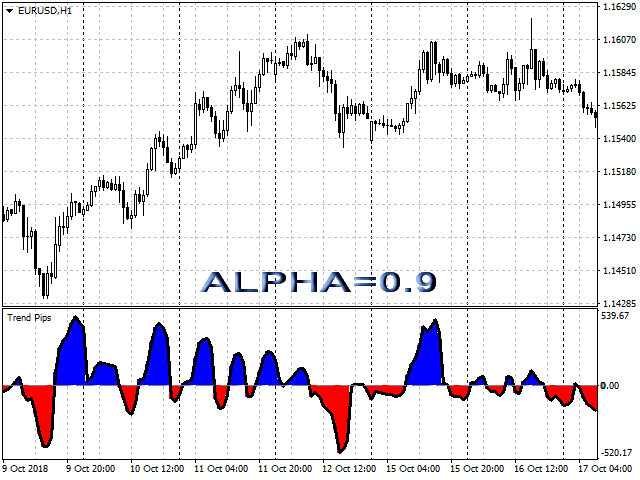 Higher values (up to 0.95) are useful for scalping. You can see the differences between high and low ALPHA on the pictures. With Trend Pips indicator, it is so simple to see trends and their power. Each trend starts by crossing zero line (time axis) and then continues until reaches to its maximum value. You just need to wait for starting a new trend or in the other hand when the indicator crosses zero line. When Red indicator changes to blue or vise versa you can open a new position. End of trend is the point in which its value falls to zero. Trend Pips indicator works well at any timeframes. However, timeframes greater than M30 are better, because the trends are longer.